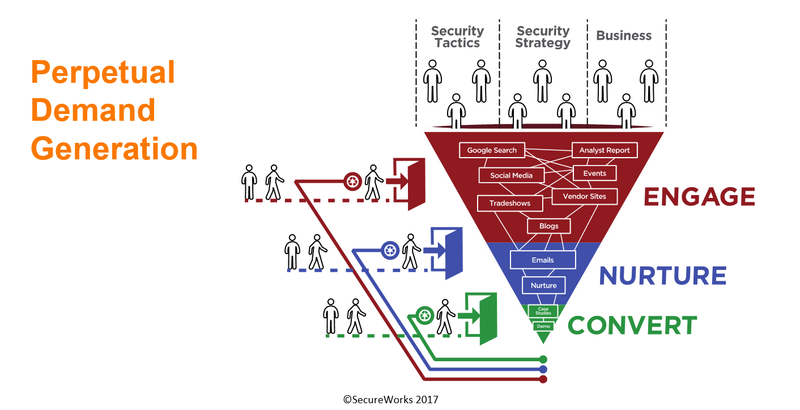 SecureWorks, a global provider of cyber-security solutions, was struggling with visibility into end-to-end results and needed a way to clarify the relationship between sales and marketing. On top of that, the team wanted to create a better customer journey and experience. By transforming these processes, the team has been able to double the conversion rate and track personas through every step of the funnel. SecureWorks is a global provider of intelligence within cyber-security solutions, which is comprised of a variety of both managed security services as well as consulting services. Essentially, it operates as an early warning system for cyber threats that promises to prevent, detect and rapidly respond to cyberattacks. “Our clients range from small and mid-size business all the way through to the very large enterprise, Fortune 50. We do have a global presence. We have customers in 59 countries,” said Kira Mondrus, Director of Global Marketing, SecureWorks. The reason being that the company had grown very quickly, and marketing had not truly aligned with sales on a lead management process. “So I essentially lost visibility right after the marketing qualified leads were handed over into the sales function,” she said. Beyond the lack of visibility, she added, the team needed to evolve the marketing program from being inside-out driven and become buyer centric. To do this, the team needed to create a lot of content, align with other teams, and rework the entire demand-gen program and process. Mondrus started at SecureWorks in July of 2014 and began working on this transformation within of a couple of months, launching efforts in January 2015. The team went through the entire business case for a demand-generation transformation for the company. “We started out with the strategy phase, which was initially taking a look at our current program, our current results, our offerings, how we were going to market and what that — potentially — would look like,” Mondrus said. This was done through a series of interviews, as well as deep dives into data, content and other various assets, including the current lead-management processes, of which there were multiple, all uncoordinated. This research brought out key personas who are involved in the buying process within enterprise markets and targeted businesses. It also provided insights into the buyer journey, various aspects of how to combine content as well as marketing channels to build an inbound program, rather than an outbound one. To get into the buyer journey, the team boiled down to insights into the digital path customers would take, what channels they were in, for example, and then mapping that journey to understand how leads would be qualified. “We looked at how we would need to align our technology and our people around a process that would help us with end-to-end visibility,” she said. This entire transformation was built on a desire to put forward a buyer-centric view, not a product-push view. “Rather than looking at our go-to market as a series of campaigns with a start date and an end date around a thematic, by looking at the pain points of our target audience, we are addressing these throughout their journey for the various buyers. This [demand-gen] engine is always on, and it's always running and individuals are coming in and out, and we're able to nurture them,” she said. From this reworked system, Mondrus and her team are able to understand, depending on what content a customer interacts with, where they are in the buyer journey and nurture them forward accordingly. “That was, I'd say, probably the biggest transformation — having this always-on engine in place, and having the buyer in the driver's seat of how they interact with the content and with the campaign, rather than having us dictate when it is that we push out the messages,” she said. “Ideally, in time, we're going to do more,” she said. Paths to purchase depend on many different factors, she said, including an immediate division based on what problem the customer is trying to solve. “If you've been breached, and you come to our website and fill out a, ‘Help, I've Just Been Breached’ form, that's going to be an immediate signal, if you will, for us to help,” she said. In many cases though, customers are starting out with early stage education and thought leadership, where the team can help them understand why they want security service and why they would want to partner with SecureWorks. “Obviously there's no shortage of security technology and tools, but it's really a question of finding the right resources and being able to employ those resources to put in a solid security program for your company,” Mondrus said. Through the interviews of the target personas, she said, the team was able to get a “pretty good sense of the types of questions, or challenges, they may have over the life cycle of their buyer journey,” she said. More importantly, they were able to come up with many potential answers to those questions, in the form of different content that provided a clear next step. “As an example, if they downloaded an RFP Toolkit, we had an idea that they were pretty far down the journey, and we would ask them enough questions in the web download to get a strong profile so they were ready to hand over inside sales, as opposed to if they were doing some kind of high level thought leadership on some other security issue that may be top-of-mind,” Mondrus said. In content forms, the team deployed “progressive profiling … to its fullest capability,” she said, explaining that as the content was aligned to the various stages of the buyer journey, so were the questions on the web forms. By the end, it was a fully formed questionnaire, but the team made sure that if they only engaged a few (five to six times) with early-stage content, they wouldn’t ask the more intrusive questions. This was out of a desire to avoid straining the digital relationship before the prospect was ready. “We [designed and launched a] new website in parallel to our building-out this perpetual engine and revamping all of our processes. We had an old site in place. Our website existed pre-days of the Dell acquisition. It was running on a platform that was no longer supported. It had probably a thousand pages of very long technical content in it. We really needed to modernize,” said Mondrus. The team built up a website on a new platform, and because they were doing these programs in parallel, they were able to implement all of the demand-gen best practices into the new site. “We used the website as a nurture engine. We're able to put progressive content on the various pages to keep moving people forward in that buyer journey. We simplified the website. It's obviously visually a lot more appealing. The content is shorter. We address multiple personas,” she said. This effort was launched fully across six web properties in four languages. And to assure continuity for the customer experience, tasking a central team with decision-making was key. “It helps when everything is centralized. My team is global out of Atlanta. Everything is done with the central team leading the charge, with regards to messaging, with regards to content, approval process, workflows and so forth. That part of it was pretty easy because it was all under my organization,” Mondrus said. Internal efforts for transparency and communication were aided by representation from many aspects of the company, she added. “It was huge change management, in terms of how the marketing team thinks about going to market, and how sales interact with Salesforce and so forth,” she said. 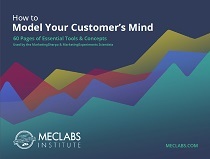 What started out with a top-down decision required representation from each of the key stakeholder groups, “so a variety of leaders from the different sales teams, from sales operations, from our IT organization … needed to support us, as well as the different marketing stakeholders,” Mondrus said. Before any decisions were made, it was decided that everyone had to be on the same page before moving forward. This was quite an effort, as there were not only internal stakeholders, but a vendor that served as the primary partner for the demand transformation initiative, a website vendor, and outsourcing for some of the content. “Now that we are live, it's still continual dialogue across the different stakeholders because, as we're looking at results and optimizing, we need to make sure that everyone is on the same page with us,” Mondrus said. The change management, she added is “really big for a company of our size and all the different players on a global scale,” she said. This transformation has turned marketing into a true revenue contributor, she added, and allowed them to provide a better client experience. She said that the team wanted to make sure that as the audience engages, before they ever get into sales, that they’re having a great experience through finding answers to questions. In the future, she said, the team is looking to extend what they have learned from a prospect approach into the client lifecycle. “We definitely want to keep this kind of perpetual approach in mind — that would go all the way through from acquiring clients to their client lifecycle,” she said. With this program now in place, the team is able to see exactly how every marketing channel performs, as well as the role of every single piece of content within the program. “I can tell you there were certain areas, certain channels, that we used to invest in heavily, that I have scaled back completely and then others that we've revamped the approach,” she said.